Website and app analytics are unfortunately an often overlooked aspect of UX. Of course, analytics is no replacement for other UX methods, but it can feed into them to ensure that both quantitative and qualitative data are covered. UX practitioners may use their website analytics data to find out what’s happening on a website, but few people use their analytics data as a base for user research. 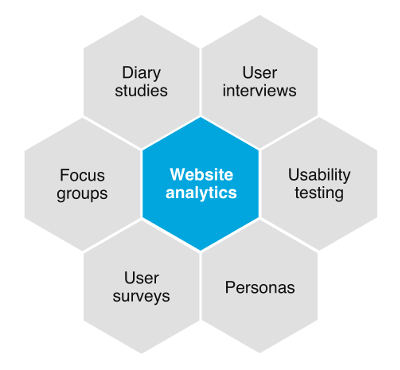 This article will look at how analytics can help inform the user research process. Knowing who your users are is crucial to any UX process. This is why user research plays such a vital role. User research consists of a whole range of different tools and techniques, but what underpins them all is gathering useful data about your users. Research is not about asking people what they like or what they hate, but establishing facts about your users. Analytics data is objective, providing facts rather than opinions. This data is no substitute for in-depth user research, but taking an analytics-first approach can help to provide a solid foundation to your research. There’s no one fixed model for the user research process. Different people will approach user research in different ways, and the process may change depending on the project. The following diagram shows some of the different forms of user research you might use as part of your process. Your analytics data can be used at the start of your process to get a broad idea of the types of users visiting your website. It can also be used to help you create detailed personas and to analyze the behavior of different user types. Use your analytics data to support your other research methods to get the most out of the process. To understand why your users behave the way they do, you first need to get to know them. You may make assumptions about who those users are, but you should be constantly challenging those assumptions, or at least be backing them up with facts. There’s a lot of data available in your analytics package that will help build up your knowledge of who’s visiting your website. The more you know about your users, the more informed your design decisions can be. This data can form a useful starting point for many different types of research. One area where this data is particularly helpful is in recruiting people for usability tests. In usability testing, the better the participant matches the target persona, the better the test. 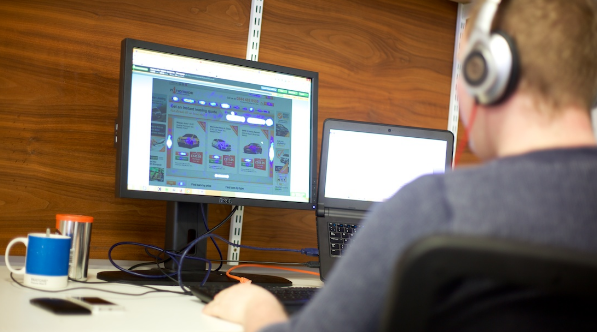 Usability testing should show how “real” users interact with your website, and where they may be experiencing issues. Knowing who your users are will improve the results of your usability testing, and will give you a better chance of uncovering the issues your real users are encountering. How do users find your website? What devices are they using? How old are they, and what gender are they? How frequently do they visit your website? What content are they interested in? As you can see, there’s a wealth of information available there that can provide a strong starting point for your user research. Personas are used in the UX process to represent the actual users of a website. They’re generally created to aid the decision making for the design process, and can be a powerful tool to help keep the focus on users at all times. The wealth of data available to you in your analytics package can be used as a starting point for creating new personas, and also used to analyze how those personas are using your website. Personas aren’t real people, but they represent real people—the types of people likely to use your website. The best ones are not just “made up”, but instead formed from in-depth knowledge of the website users and their likely behavior. As we discussed earlier in this article, your analytics data gives you information on demographics, and this data can be useful for creating personas based on details of real users. There are several methods for getting the information needed to create realistic personas for your site. Some information may be gained by talking to stakeholders who may have first-hand experience of their users. User research of some kind is also vital, though, and could include surveys and in-person interviews with real users. Your analytics should also play a big part in persona creation. Almost any metric in your analytics package can be used to help shape personas. Time on site, for example, may give an indication of whether your users are pushed for time or are likely to be leisurely browsers, while a high bounce rate may signal impatience and/or efficiency. The key to creating truly accurate and useful personas is to draw from a range of sources to get a complete picture. I’m not recommending that you only use analytics data, but it certainly provides a lot of unbiased data, which can only help with the process. Don’t use analytics data in isolation. Use it alongside other research methods, rather than instead of them. While analytics data can be useful for persona creation, it can be tempting to rely too heavily on this data, which could lead to inaccurate personas. For example, if you’re creating two personas for a website and your data tells you there’s a 50/50 split of male and female users, it makes sense to have one male and one female persona. If the same website has 50% of visits from the UK and 50% from the USA, though, what would that mean for your personas? Should you make the male persona from the UK or the USA? There’s no way of answering that with the available data alone. This further underlines the need to do more user research to get a clearer picture of who your users really are. Once you’ve got a good idea who your users are, you can create segments to see how different groups of users are behaving on your site. A segment is a subset of your analytics data. For example, a segment might be made up of users from a particular country or city. Another segment might be mobile users or perhaps for users who visit a particular section of your website. Segments can be made up of a single dimension, or multiple dimensions, such as French-speaking women using tablets. Once you have your segments, you can apply them and view your navigational reports to see how representatives of your personas are interacting with your site. This whole process can be cyclical, too. You can use analytics data to inform your personas, and then use those personas to interrogate your data further. Hopefully, this article has helped convince you that analytics has a big part to play in the user research process. I’m not proposing you only use analytics for research, as there’s no substitute for talking to real users. But you can get a lot of really useful information from your analytics package, and this can give a solid foundation for your user research process. As UXers, we know that understanding who our users are is absolutely key to creating a good experience. Analyzing your website’s analytics data is a great way to improve that understanding. AMA Event! Wish you knew more? Perhaps chat with Luke about UX and analytics yourself? Or do you have questions about gathering insightful analytics, join us for our Google Analytics for User Insights AMA with Luke Hay on Thursday 26th January at 12pm (PST). 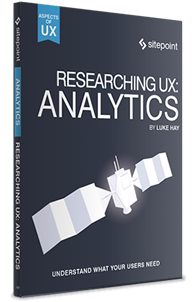 If you’d like to learn more about using analytics data in UX processes, check out Luke’s new book, Researching UX: Analytics, which goes into much more detail about using an analytics-first approach to UX. Have a sneak peek and check out a sample chapter from the book. Luke Hay is a UK-based UX Consultant whoâ€™s been working with websites since the 1990s. He prides himself on taking a user-centric, analytical approach to design, development and optimization of websites and apps. Luke currently splits his time between working as the Senior Conversion Strategist at integrated digital agency Fresh Egg, and as a freelance UX and analytics consultant and trainer. Always involved in his local digital community, Luke has helped organize and curate events for UX Brighton, and is one of the organizers of UX Camp Brighton.